Once or twice a week, sweep a saturated cotton pad over cleansed face and throat with circular motions, avoiding contact with eyes and lips. Prior to exposure to the sun, use sunscreen to cover areas where AHAs have been applied. Do not use more frequently than instructed above. 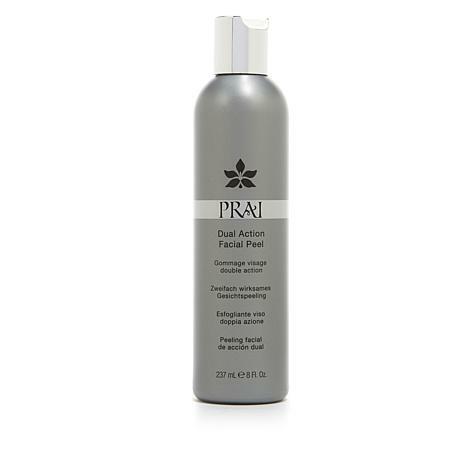 PRAISSENTIALS Dual Action Facial Peel, 8 oz. Ingredients: Aqua/Water/Eau, Lactic Acid, Sodium Hydroxide, Butylene Glycol, Aloe Barbadensis Leaf Juice Powder, Salicylic Acid, PEG-7 Glyceryl Cocoate, Polysorbate 20, Glycerin, Sodium PCA, Allatoin, Chamomilla Recutita (Matricaria) Flower Extract, Laminaria Digitata Extract, Tetrasodium EDTA, Phenoxyethanol, Ethyhexylglycerin, Fragrance (Parfum), Benzyl Salicylate, Hexyl Cinnamal, Butylphenyl Methylpropional, Limonene, Alpha-Iosmethyl Ionone. Love this peel! My skin is so soft and smooth after using it. It does remove more dirt even after washing. I will certainly get this again. I love Prai products. makes my face and neck look great! This is like using the individual pads but actually better because you can use as much or as little as you need. I use it sometimes before going out in the evening and sometimes I put it on right before my nightly shower and rinse it off there. . My skin feel so soft afterward and it stays that way for a couple days. I get a lot of compliments on my skin. I like that. Ive ordered this many times I LOVE it!